PT Bank Pembangunan Daerah Jawa Tengah - BPD Jateng or known as Bank Jateng is a reputable regional development bank headquartered in Semarang Central Java. Bank Jateng is the Regional Development Bank of Central Java Province and is owned together by the Government of Central Java with all the Government of City / County in Central Java. As of December 2016, Bank Jateng is 53.29% owned by the Central Java Provincial Government, and 46.71% by the Regency and Municipal Governments in Central Java Province. 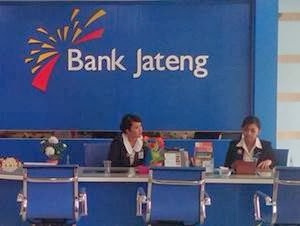 Started to establish since April 1963, Bank Jateng now has 36 conventional branch offices, 116 sub branch offices, 153 cash offices, 298 payment points, and 541 ATMs. Bank Jateng also supported by 4 sharia branches, 7 sharia sub branches, 7 sharia cash offices, and 145 sharia services (as of December 2016). Bank Jateng's head office is registered at Jl Pemuda 142 Semarang. In 2016, Bank Jateng recorded a satisfactory performance growth. According to PT Bank Pembangunan Daerah Jawa Tengah Annual Report 2016 as cited by JobsCDC.com, Bank Jateng posted an increase of 23% in total operating income from Rp 2,498.01 billion in 2015 to Rp 3,072.60 billion in 2016. Total operating profit amounted to Rp 1,341.15 billion in 2016, which represented an increase of 13.52% over total operating profit recorded in 2015 of Rp1,181.39 billion. Minimum D3 from an accredited university. Minimum GPA of 3.00 for D3 and 2.75 for S1. Minimum 2 years of experience in bank or financial institutions. Have own vehicle and possess driving license (SIM). Good looking with minimum height of 170 cm (Male) or 160 cm (Female) and ideal weight. Operating knowledge of Microsoft Office (Ms Word, MS Excel, MS Power Point). Target oriented and able to work under pressure. Maximum age of 24 years old for Fresh Graduate and 26 years old for those who have minimum 1 year of experience in bank or financial institutions. Single/not married and willing to not get married during the program. JobsCDC.com now available on android device. Download now on Google Play here. Please be aware of recruitment fraud. The entire stage of this selection process is free of charge. Bank Jateng - D3, S1 Fresh Graduate, Experienced Staff Bank Jateng January 2018 will never ask for fees or upfront payments for any purposes during the recruitment process such as transportation and accommodation.